Club Carlson is following Hilton, Hyatt, IHG and pretty much every other major chain by introducing “Members only” rates that are discounted by up to 10%. You need to sign up for the Club Carlson program to be eligible for these but it is free. 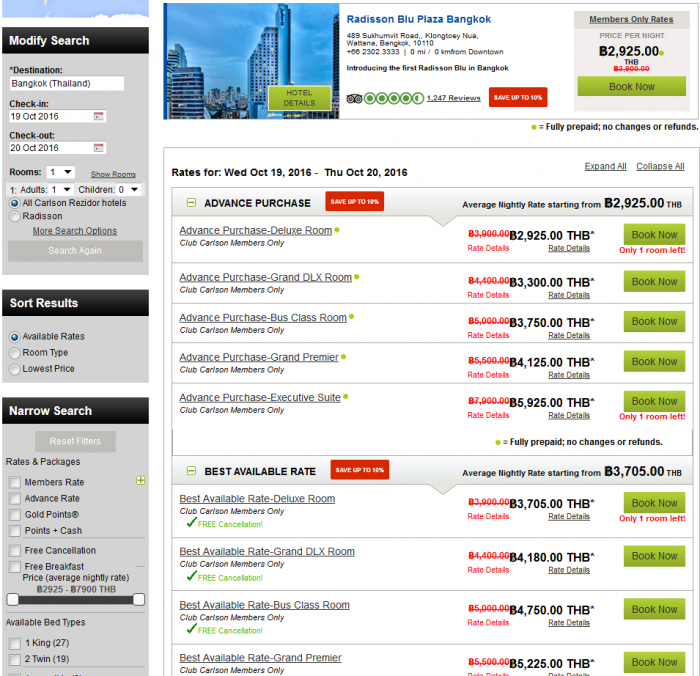 These rates shouldn’t be available using OTA’s such as Priceline or Expedia. Here the advance purchase rate is an additional 5% off for members. Hotel chains are “battling” OTA’s that have increasingly rising market share on hotel bookings and they would prefer not paying 15% to 25% to likes of Booking.com and Expedia. Also, this makes it easier for hoteliers to ensure that they actually have the lowest prices on their websites which has rarely been the case if you had looked around. The Members Only Rate offer is valid for up to 10% off the Best Available Rate at participating hotels booked on Carlson Rezidor Hotels brand websites, brand mobile sites, and brand mobile apps. You must be a Club Carlson member to be eligible for the Members Only Rate offer. The Members Only Rate offer varies by hotel, is subject to change, and may be different each night of stay. The Members Only Rate offer is available for individual bookings only, not valid for existing reservations, and may be offered in conjunction with designated other discounted rates, brand offers or packages. The Members Only Rate Offer is not eligible for a free award night with Gold Points® redemption. Other exclusions may apply. The Members Only Rate offer is subject to availability, blackout dates may apply, and may be changed or discontinued at any time. Participating hotels are subject to change at any time without notice and the number of rooms available for this offer may be limited and may vary by hotel. Cancellation policies vary by hotel. Void where prohibited by law. Next articleLoyaltyLobby Giveaway: $500 In Hotel Points Or Airline Miles Of Your Choice!